If you will work from home, you need to ascertain whether your space can accommodate a photography business. Unlike a computer programmer who only needs computer set up in one corner of the house, a photography business will require more space. Plan, design and set-up your work space. How you set up your workspace will depend on space availability and how you intend to operate. Determine what space you will need: office, darkroom if you are going to do your own developing, and storage area for your chemicals and equipment. Depending on your specialty, you might need a studio and a waiting area for customers as well. If you are going to do small product photography, you can simply set it up in a corner of the room. However, you will need more space if you are going to shoot portraits, family pictures or complicated set-ups. The minimum space for portraits should be about 8 feet wide and 10-12 feet wide to hold backgrounds, lights, and camera equipment. The good thing though about a home business is that you can start small. Initially, your bathroom can double up as your darkroom. You can do all the business aspects, like balancing your books and preparing your correspondences, in your dining table, kitchen or in an extra room in your house. However, you must consider the tax rule that you can only claim business deductions from your home office if the space where you work is used exclusively and regularly for that business. Improvising and using other spaces in your home for your business like the patio or the kitchen may not qualify you for home office deductions come tax time. Ken Oberrecht in his book, “How to Start a Home-Based Photography Business” recommends that you need to pay close attention to your equipment requirements in planning the physical structure of your business. While a photography business can be run even in an apartment, plan accordingly particularly for your storage requirements. Once you have set everything up, you are now ready to promote and sell your services. Marketing is an essential aspect of any business, and it entails building a sound and excellent reputation, then researching and locating potential clients. You should allocate time every day to market your business. In fact, in the early days of your business, most of your time will be spent getting the word out about your business. As part of your business planning process, the first step in developing a marketing plan is to develop solid information about your target market. This includes market size, sales potential, assessment of your competition, information on pricing and marketing practices. For example, your main markets will focus on editorial and advertising if you will concentrate on nature and wildlife photography. Your major buyers will include art directors and picture editors of nature magazines, travel magazines, wildlife picture books, calendars, textbooks, reference books, even textbooks. Make a list of possible users of nature and wildlife pictures in your area, and determine their levels of demand. Create a portfolio of your best work. It must be a representative sampling of photographs that demonstrate your skills and versatility. Your portfolio will be what you will show to your prospective clients, and its quality will help determine whether they will hire you or not. Public relations and promotion strategies often work well for a photography business. You can prepare press releases to announce any significant achievement that you’ve made, including winning a local photography contest. Network with buyers in your target market, or even volunteer a picture to a local charity or non profit organization. Offer to teach a photography workshop to get your name out in your community. You can also increase the number of people who see your salon prints by distributing your works in galleries and museums. Try to get a business establishment to display your work: a lobby or a waiting room can be a good showcase that may attract potential buyers or advertisers. If you have adequate resources, you can also embark on various advertising campaigns. 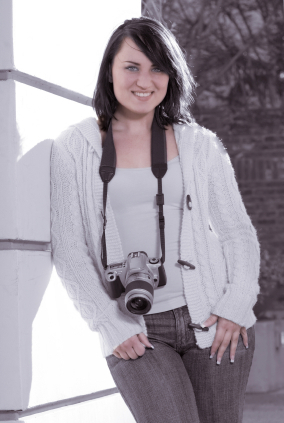 Listing in the Yellow Pages is one of the cheapest yet most effective way of advertising a photography business. You can also engage in direct mailing campaign; with the right client list you may be able to reach a broad or concentrated market. If you are engaged in commercial, architectural and graphic-style photography, brochures can be an effective form of advertising. Of course, nothing beats word of mouth marketing. It is the kind of advertising that grows out of your reputation and is spread by people who know your work and freely recommend it. An essential aspect of your marketing plan is your pricing strategy. Set too high a price and you might price yourself out of the market. Check out professional organizations for your specific branch of photography. Or consult reference works such as the Photographer’s Market, which quote typical ballpark prices. Pricing for an advertising photography may consist of basic daily fee, creative fee, usage fee, and expenses plus margin. Creative fee is the fee you set for your creative talent over and above the daily fee. Usage fee is an opportunity for further price differentiation depending on how the photographs are used. Expenses plus margin are all the out-of-pocket expenses associated with the shoot, plus a percentage margin added to the cost of any items or specialized services that you need to buy such as film, prop rentals, or services of hair stylists and models. You should also add travel and food expenses if you will be required to travel. Some other billable expenses (some of which you can pass on at cost while others with margin), particularly for large, multi-day photo assignments, include: film and processing, assistant, stylist, models, wardrobe, props, location scout, location fee, airline tickets or other transportation, hotel, meals, rental vehicles, gasoline, tolls and parking, telephone and other miscellaneous expenses. Depending on the end-user of the photograph, you may be able to include a royalty fee with the flat one-time fee. This is particularly true for coffee table books, where the photographer may receive an advance to cover expenses and a royalty per copy sold. Retail photography customers, on the other hand, expect to see an all-inclusive price for a product. For a wedding assignment, for example, you can set a flat fee per hour (over and above any photographs ordered) and require a minimum dollar order per hour of coverage. To protect yourself against cancellations, you can require a non-refundable payment for up to four hours of the minimum per hour order followed by a significant advance payment two weeks prior to the event. Others set a fixed price for a set number and size of prints per package. Stock photographs are priced on a per photograph basis. The factors that will affect the pricing of a stock photo are: the price range acceptable to the buyer, intended usage (how many people it will reach and for how long), rights being sold, and the uniqueness of the photograph. A photograph that will be used in the front cover of an encyclopedia with a print run of 40,000 will be priced differently from print advertising with a 3 million circulation. Whatever your field in photography, the key in determining your pricing strategy is to make sure that your prices meet your minimum profitability objectives.